Uncertainty swirls around how the Black Sea got its name. Some speculate that it stemmed from black sludge that covered objects in the sea's depths. Others say it was coined by sailors who observed that the water appeared black during winter storms. 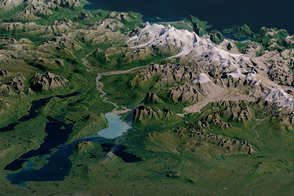 Perhaps the sea would have a different name if people had seen it from space in spring or summer, when the sea is transformed from drab to colorful. 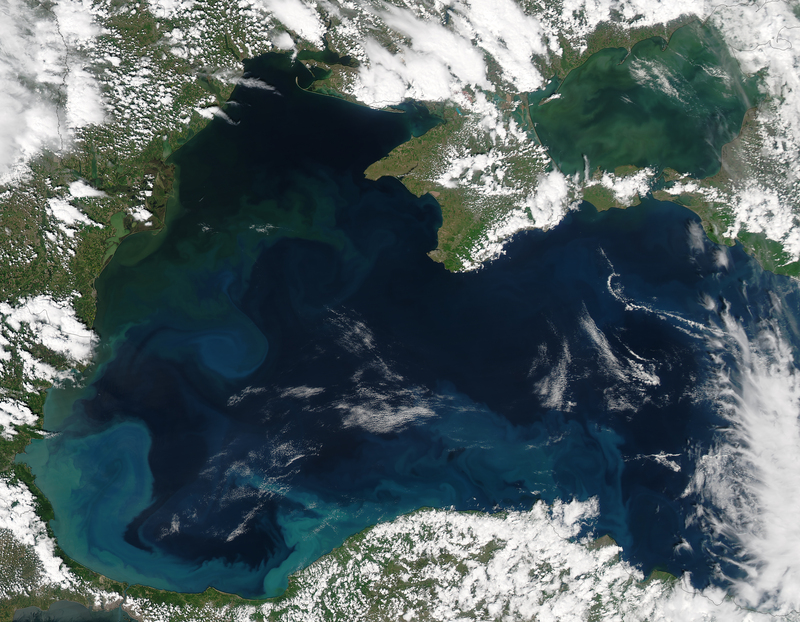 On May 7, 2016, the Moderate Resolution Imaging Spectroradiometer (MODIS) instruments on NASA’s Aqua satellite acquired this natural-color image of the Black Sea, a large inland body of water bordered by Bulgaria, Romania, Ukraine, Russia, Georgia, and Turkey. 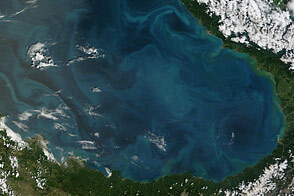 Light blue colors toward the middle of the sea are likely the result of blooming phytoplankton. Phytoplankton are the “primary producers” of the seas and oceans. These plant-like, microscopic algae, bacteria, and protists use chlorophyll to make food from sunlight and dissolved nutrients. 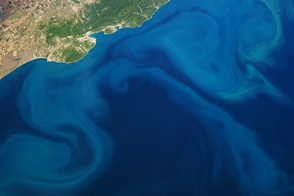 More than 150 different types of phytoplankton have been observed in the Black Sea, supporting a rich bounty of fish and other marine life. One type of phytoplankton found in the Black Sea are coccolithophores—microscopic plankton that are plated with white calcium carbonate. However, early May might be too soon to see them blooming here in large numbers, according to ocean scientist Norman Kuring of NASA’s Goddard Space Flight Center. Their signature milky blue swirls are more common in summer. On the other hand, climate change is altering the timing of phytoplankton blooms around the world. Only a surface sample can confirm the exact composition of this bloom. Other factors could also contribute to the myriad colors. The middle of the sea is quite deep, diving down more than 2000 meters (7,000 feet). 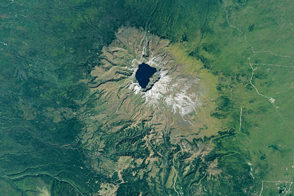 In this region, surface water generally does not mix with the deeper, saltier, anoxic waters. But in the shallows closer to the coasts, some color could be due to the mixing and stirring of bottom sediments. Browns and greens are also common near the shore after a heavy rain and at the mouths of large rivers like the Danube. 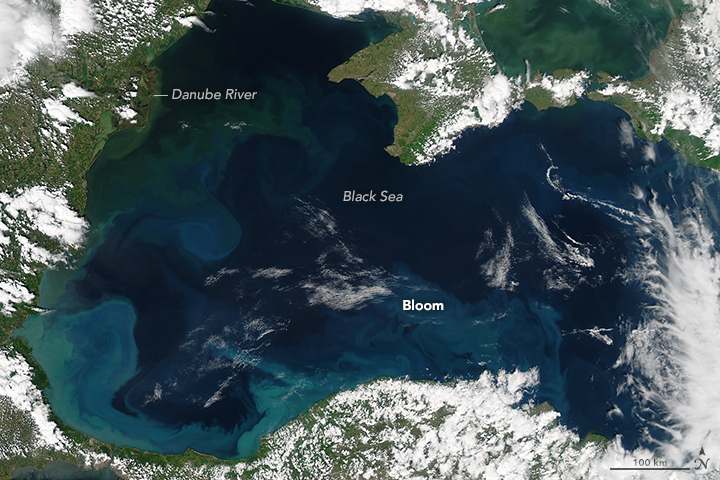 Phytoplankton and stirred up sediments deliver a splash of spring color to the Black Sea. Smithsonian Science Education Center (2014) Why are The Seas named Black, White, and Yellow? Accessed May 11, 2016.